This helps me get to orbit, and helps me land on other planets/moons. You can get older releases here, just go through the build history and find the one you need. Fantastic mod. Thanks for your efforts! Open the mechjeb window and you will see an option marked 'Settings'. Click that, and the new window that opens will include an option for 'Hide Menu Button'. Is there a way to remove that little MechJeb tab at the right of the screen? Or move it? It's in the way of my resource panel so I can't see whether I'm losing or gaining till stuff drops a little ways. It basically covers up my red and green up/down arrows at the end there. Works for docking onto ships as well. Well that worked, aside from MechJeb not knowing how to latch onto an asteroid. I spent 3 hours trying to catch the thing while staying within 2KM the entire time, I kept flying past it. I couldn't get my ship front to hit it softly either, ended up losing bits of it. Docking module should have some sort of asteroid catch module with it too. :P Like the landing module's targeting thing, you just pick where you want your ship to hit the asteroid at with the thing that latches on. You have to go into the tracking station and select one to actually track to bring the asteroid into "existence". Then you can catch it. I'd like a way to intercept those floating question marks all around kerbin. I've tried to reach them before with no success. Hi. I had the same problem. The cause was the toolbar delivered with the docking port alignment indicator. With the new version everything works again. I suggest checking the forum thread for more information - the thread has a pretty active user group, so you are much more likely to get an answer there. Hi, love the mod, but the current version is not working for me. 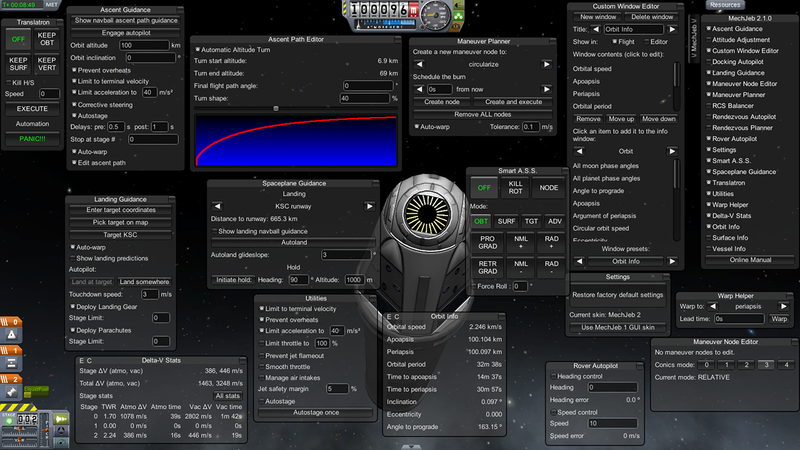 It refuses to show the MechJeb tab (either with standard mechjeb or the pod version. The mods in the list below with a * were newly added mods at the time I installed the update. I pulled the *s out and still no joy.